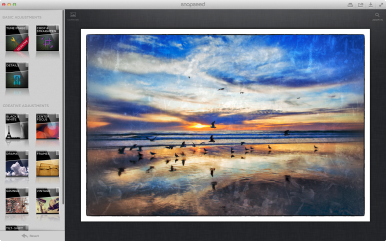 Nik Software has announced that it’s bringing Snapseed, its popular photo-editing software for iOS, to the Mac. Like the iOS version, Snapseed allows users to adjust various qualities of photos, including white balance, saturation, contrast, and more. In addition to sliders that let users manually adjust aspects such as color and exposure, the software can also autocorrect these levels for quick, painless enhancement. The Mac version also takes advantage of the same Control Points that Nik Software uses in its other products, which can help users make selective adjustments to parts of a picture. Additional editing features include tilt-shift, custom photo effects, filters, frames, and more. You’ll even find the Structure control, borrowed from Nik’s pro-level photo software, which helps enhance details in photographs. When you’ve edited your image, Snapseed lets you share it with others via built-in links to Facebook and Flickr, as well as emailing or printing the images. Snapseed requires a Mac running either 10.6.8, 10.7.2, or later, and will be available later this month on the Mac App Store for $20.